Bentley has unveiled the exclusive Continental GT Speed Breitling Jet Team Series. Limited to just seven cars, each is inspired by one of the seven Breitling Jets, commemorating their forthcoming grand tour across the United States and Canada. Bentley's Mulliner division has re-imagined the Continental GT Speed to mirror the distinctive look of the Breitling Jets, with the exterior painted in a duo-tone split of Hallmark and Onyx with highlights colour-matched to the exact Pantone reference of the Swiss watch company's unique Yellow, reflecting the trademark look of the L-39 Albatros Jets. The colour theme is continued on the interior, with unique sculpted seats featuring accents in Breitling Yellow. 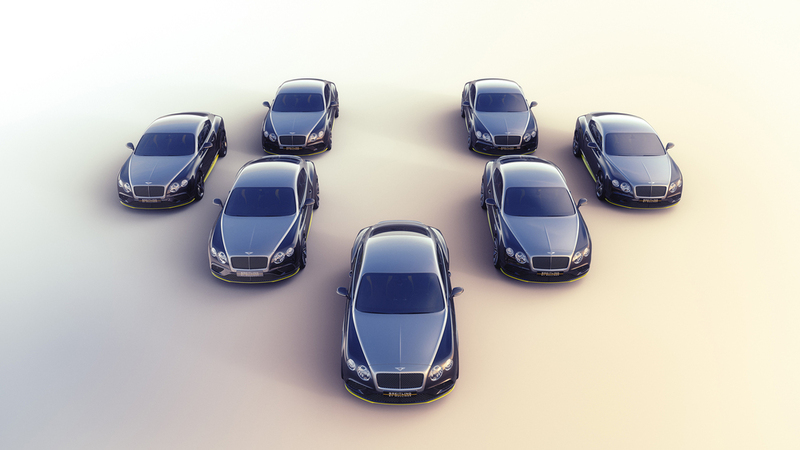 Each car is individually numbered and corresponds to one of the seven Breitling Jets. The dashboard's carbon fibre fascia panel displays an image of the seven planes in their signature Avenger flight formation, with the corresponding jet highlighted in Breitling Yellow. Similarly, Mulliner has matched the hide and thread to Breitling's signature yellow and designed a series of logos and graphics for the headrests that highlight the number of each car and the jet that inspired it. The tread plate plaques are also individually numbered. The series will debut at the Boeing Seafair Airshow on 31 July in Seattle, where the Team is performing. The key for each car will be handed over to its owner by the corresponding plane's pilot, but not until they have experienced a flight in the jet that inspired their car. Geoff Dowding, Director of Mulliner, said: "The Continental GT Speed Breitling Jet Team Series demonstrates the level of customisation Mulliner can achieve for customers. Creating this very special edition has been an exciting experience for the entire team, taking inspiration from the Breitling Jet Team's grand tour." The Breitling Jet Team is the world's largest professional civilian flight team performing in jets. The team is comprised of seven L-39 C Albatros jets that can reach speeds of up to 565 mph and fly within just a few feet of each other. Widely recognised for their precision and seamless coordination displayed throughout high-speed aerobatic performances, the France-based team is appearing in North America for the very first time.